The Deccan is a peninsular plateau located in central India that includes inland sections of the states of Andhra Pradesh, Maharashtra and Karnataka. By this definition, the Deccan Plateau makes up most of central and southern India. 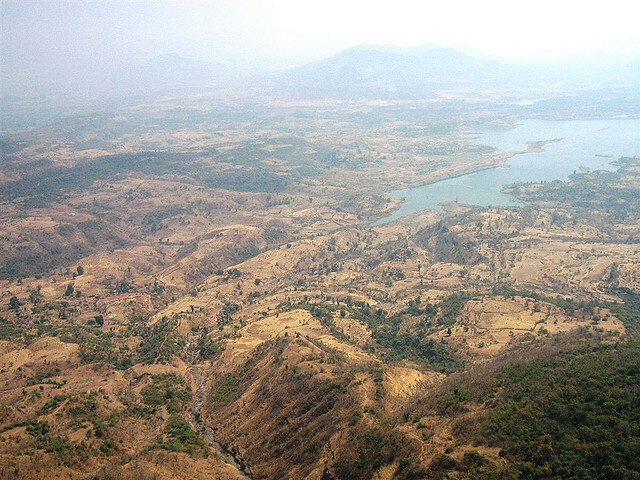 A more restricted definition limits the Deccan Plateau to the high tableland between the Narbada (Narmada) and Krishna rivers, where remnants of lava beds are to be found. Its name is derived from the Sanskrit daksina meaning "south". The Deccan is delineated by the Western Ghats on the west, the Nilgiri Hills on the south, the Eastern Ghats on the east, and the Aravalli and Chota Nagpur hills on the north. This upland is drained by a series of rivers, notably the Godavari, Krishna, Penner, and Kaveri (Cauvery), most of which start near the Arabian Sea and flow eastward to the Bay of Bengal. The river valleys are densely populated, but the dry areas lying in between the rivers are often lightly settled. Irrigation is uneven because the rivers are rain-fed. Nevertheless, the volcanic soil of the north lends itself to cotton cultivation. Other cash crops include millet, oil-seeds, and wheat, and there are tea and coffee plantations in the south. Among major Deccan cities are Poona, Hyderabad, and Bangalore.